Okay, NOW I think I’m done canning for the year. I finished processing all of the thirty pounds of apples I got, and after doing two rounds of Applesauce, I cooked up a huge pot of Apple Butter and canned it all. Ended up getting seven half-pints and two pint jars. I’m so excited about this one, it was my first time doing a fruit butter. It is so, SO yummy! 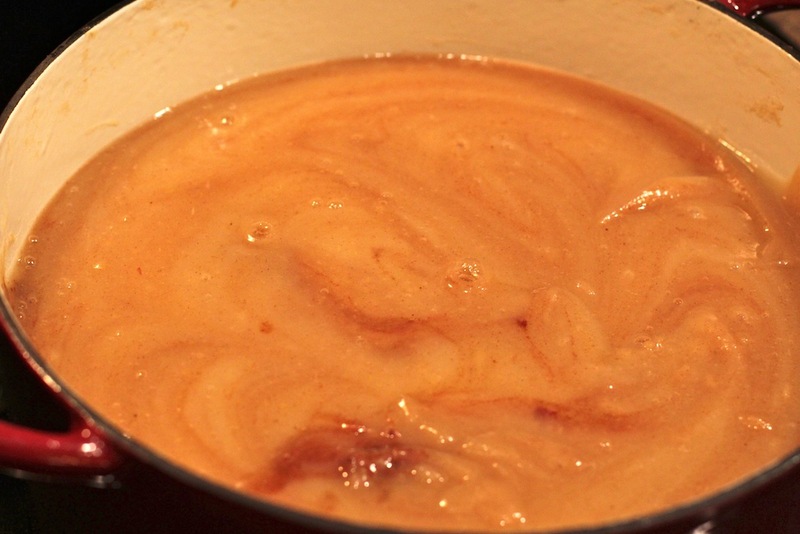 It cooks down and the sugars caramelize, the fruit butter gets very rich, thick, smooth, and a beautiful pinkish-golden color. I could eat it in bowl-fulls spoonfuls. 🙂 It’s just a cinnamon-y taste of the Holidays that are just around the corner. Seriously, when you have a spoonful you immediately think Thanksgiving and Christmas. Now that I’ve canned pickled stuff: Pickled Beets, Dilly Beans, Dill Pickles, Cinnamon Applesauce, jam, jelly, and now finally fruit butter, I totally think that if I was only able to can one thing for the rest of my life, it would be this. Mostly because I can’t get enough and you could incorporate it into some holiday baking, but also because it’s so easy to make and preserve. Once it’s all in the pot, you just let it cook down, stirring occasionally and let it go for about two to three hours. Since it’s all thick and sugary it stays very hot, so you don’t have to worry about the mixture cooling down too much before you get it in the jars and then get them sealed and in the water bath. It’s so easy, so rich, flavorful, delicious, festive, and so worth making. 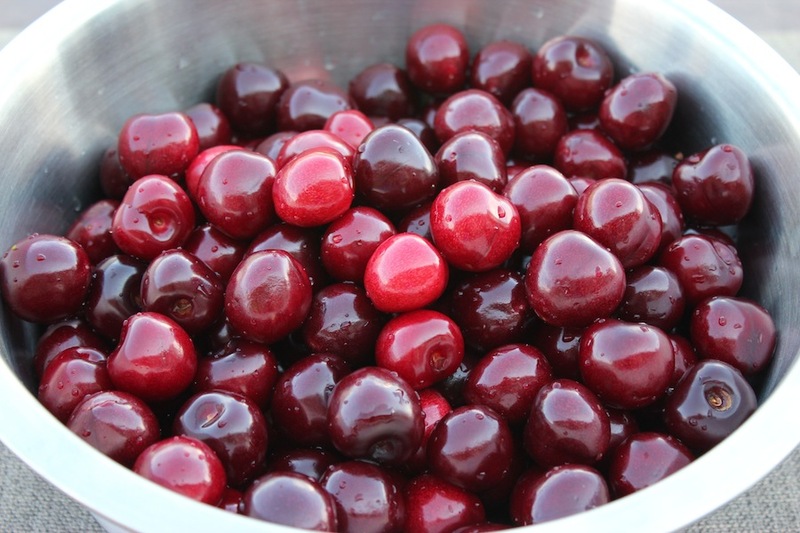 Even if you’re not canning, make a pot of it on the stovetop or crock pot, fill into a couple jars and they stay good refrigerated for up to two months! 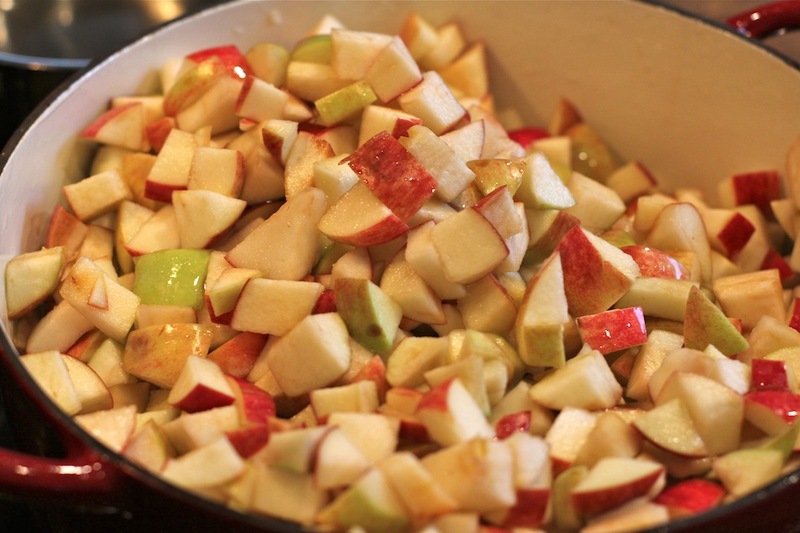 Place all chopped apples in a large non-reactive saucepan or dutch oven with the lemon juice and cider, and 1 c. water. Bring to a boil and then reduce to low, cover and simmer for about 30-40 min. until soft. 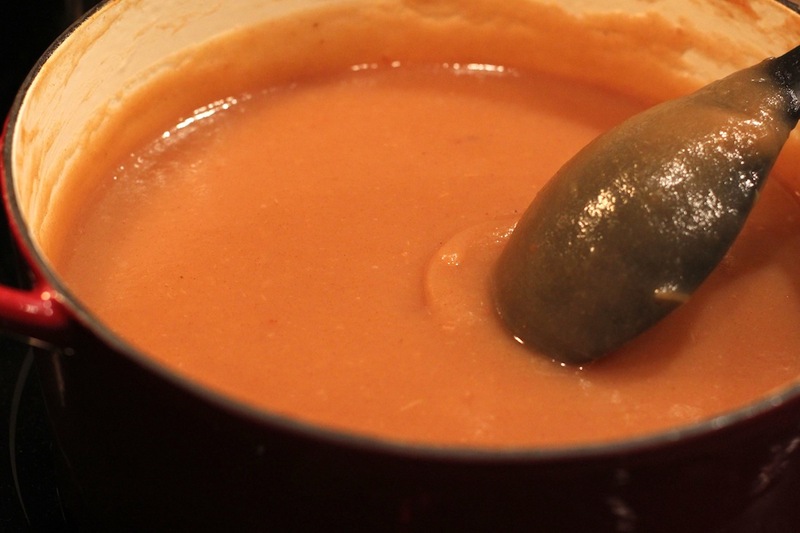 Move pot off of heat and puree with an immersion hand blender (or transfer it into a food processor in batches) until apple mixture is smooth. Place back onto heat and add the sugar and spices. Cook uncovered for about 1 1/2 to 2 1/2 hours over medium-low heat until the apple butter has reduced quite a bit, is thick and mounds on a spoon. Stir often. Fill hot, sterilized half-pint jars and leave 1/4″ headspace, remove air bubbles, wipe rims clean and seal the jars with the lids and rings, semi-tight. Process the jars in boiling water bath for 10 min. (add 1 min. for every 1k’ elevation, I processed mine for 13-14 min.). Store in a cool dry place for up to a year, if you can let it last that long! Open jars are good refrigerated for up to two months. Just when I thought I was done canning for the season, I managed to round up 30-some lbs of apples off of a friend’s tree. 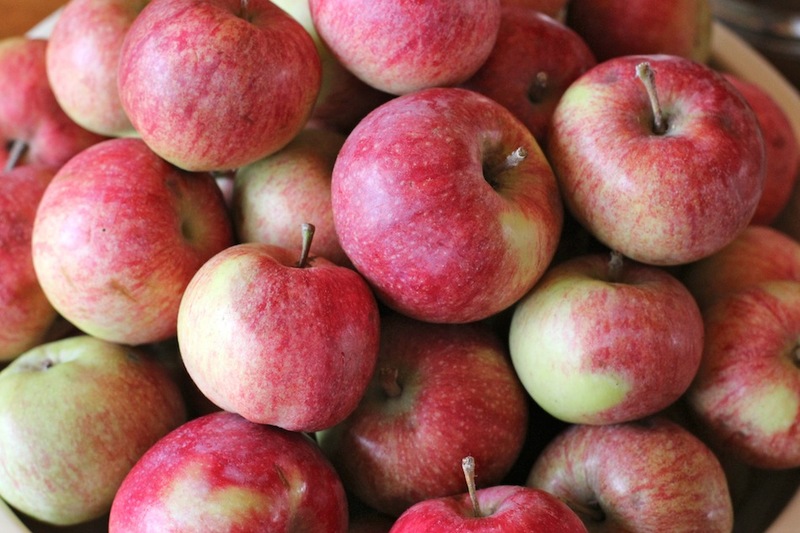 As it’s late in the season, they’re not the most crisp, juicy, or sweet apples, but they’re definitely good enough to make Applesauce and Apple Butter with! I did two batches of applesauce, and got 8 pints from about 20 lbs of apples. Now I have a lot left still to make one or two batches of Apple Butter! 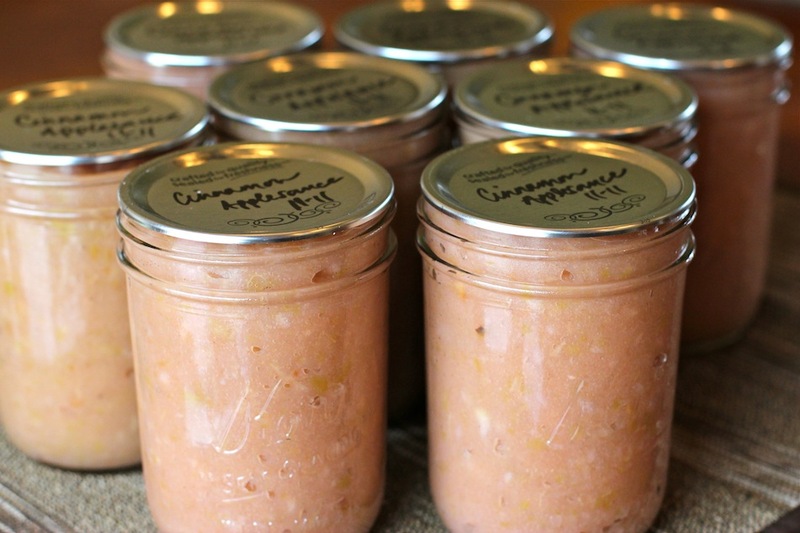 It will be really nice to be able to pull out a jar of homemade Applesauce this winter to have with some dinners. 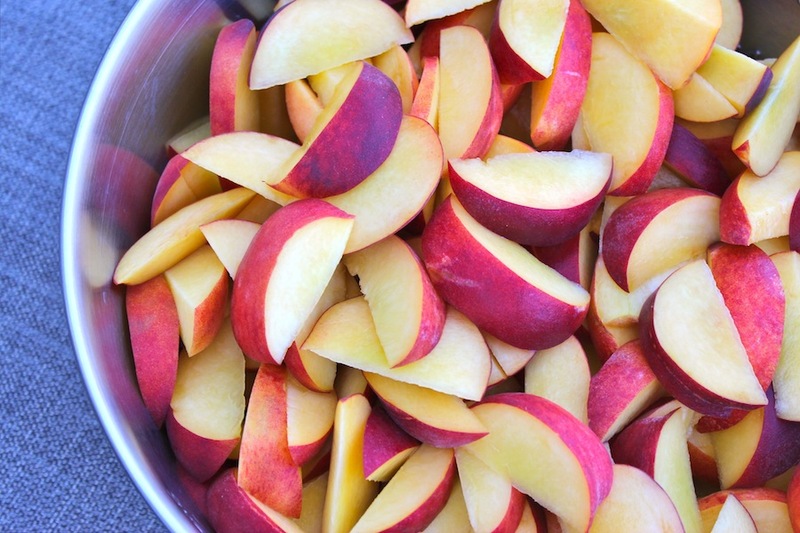 Place fresh lemon juice in a large non-reactive saucepan, then add in all the chopped/cored apples. Stir to coat with lemon juice, add in a little water if needed so they don’t stick to bottom of pan while cooking. Stir in the sugar and cover. 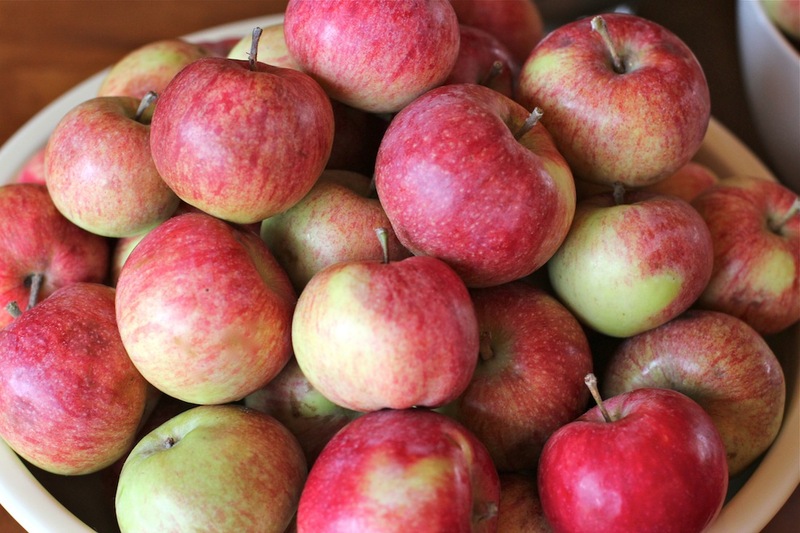 Heat over high to bring to a boil, then lower to simmer for about 20 min., stirring often, til apples are tender. Remove lid and simmer a few more minutes. Use a food mill or course sieve set over a large bowl and push softened apples through, then add the smooth apple mixture back to the pan. Cook on medium for about 5 min. until hot. 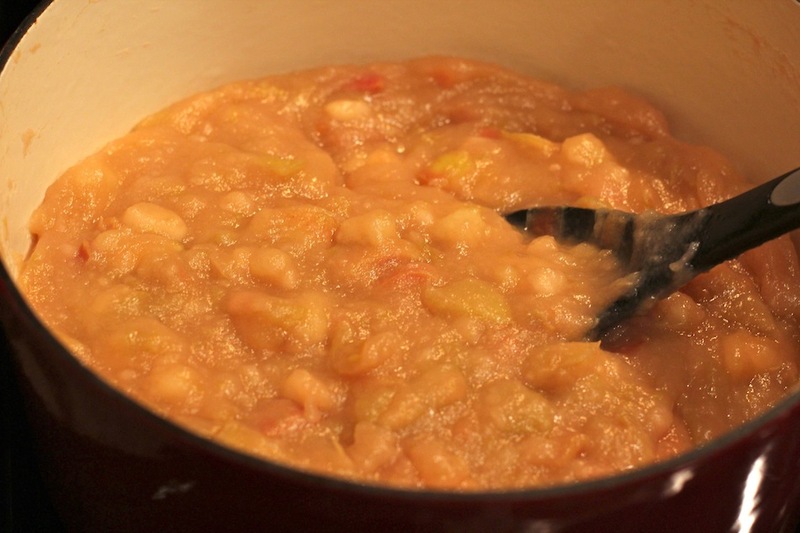 It will thicken during cooking, add in a little water to adjust consistency if desired, and take into account that the applesauce will thicken a little during the processing. Have hot, sterilized jars ready to be filled. Have lids setting in a small pot, pour in hot water from the tea pot, you can keep these lids over low heat until you seal the jars. 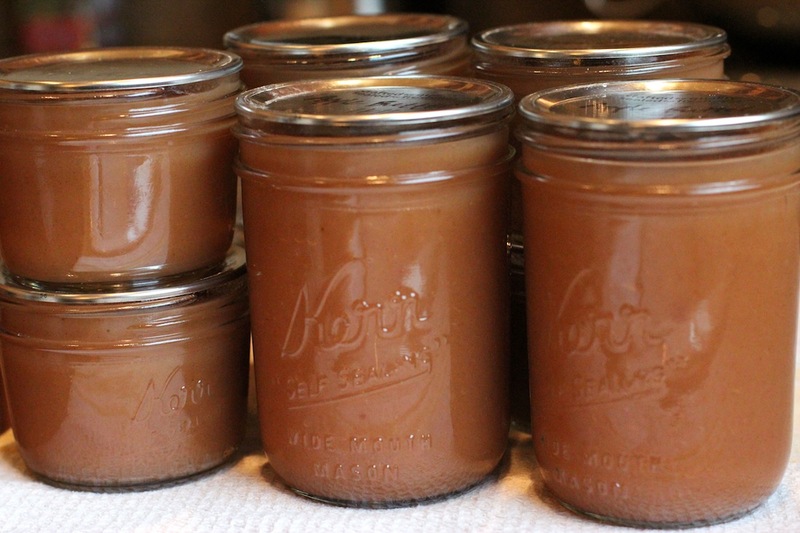 When the applesauce is simmering and very hot, ladle into jars, leaving 1/4″ headspace. Remove any air bubbles/big air pockets in jar, adjust headspace, wipe rims of jar, place warm lid on jar, then twist the ring on to seal somewhat tight. Process the jars for 20 minutes. Adjust processing time for higher altitude, + 1 min. for every 1k’ elevation. 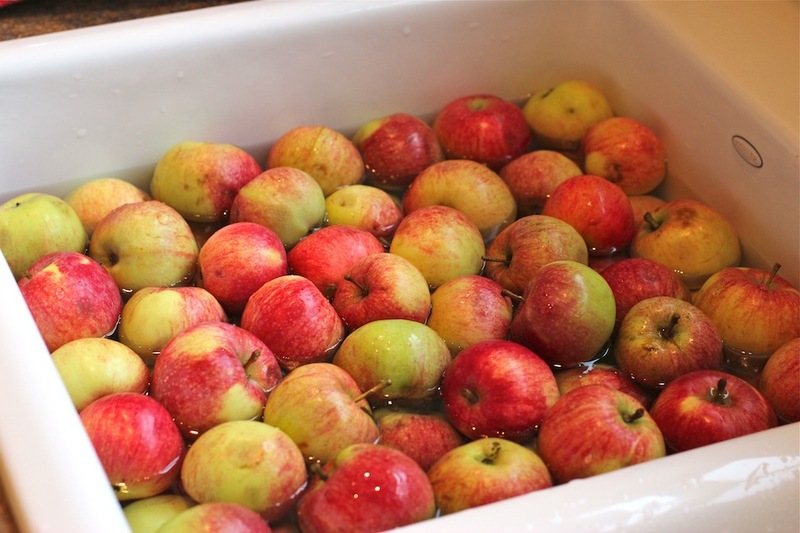 Remove jars from water bath, leave undisturbed in a cool dry place. Test seals the next day. Enjoy within a year. Even if you don’t do any canning, this is a great thing to make at home with a bunch of apples, so easy and very worth it. And now there’s Apple Butter to be made and preserved! 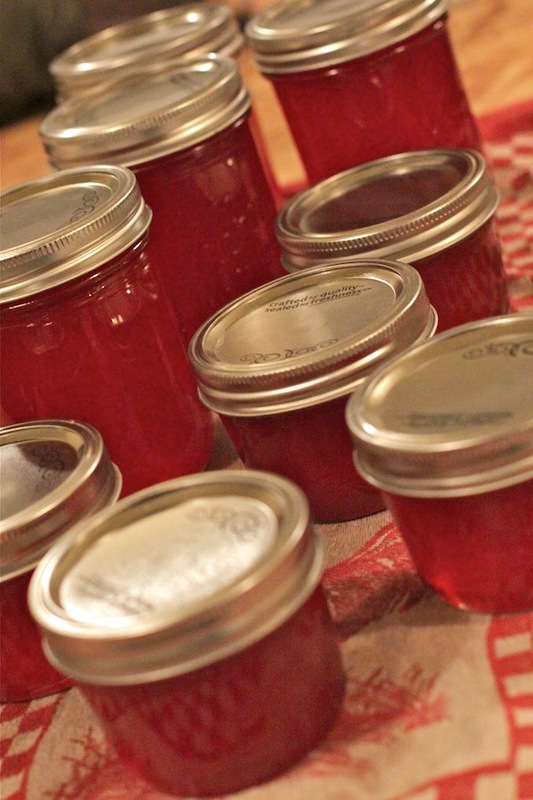 I finally finished making and canning my Crabapple Jelly and I am so excited it is done. I really have a love-hate relationship with canning and sometimes I feel like I have to move mountains within myself to just do it already. It is so rewarding when it’s done, but sometimes seems like so much work. 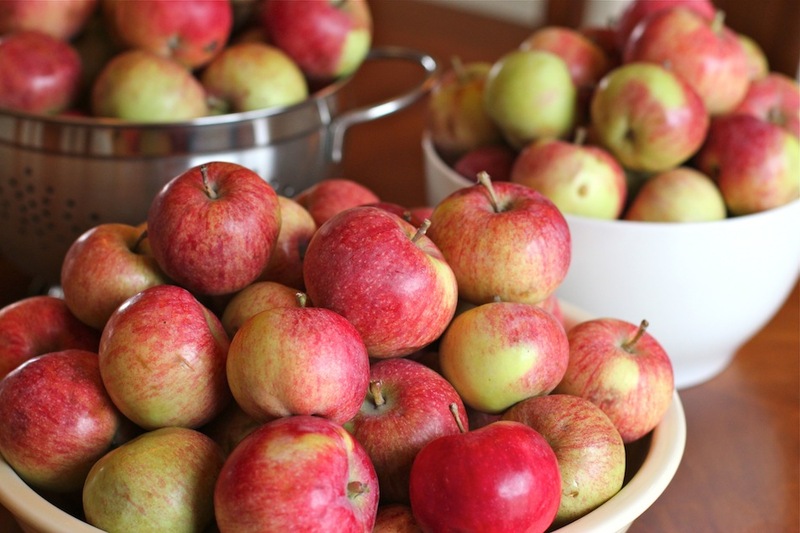 We picked the tart little apples off our tree (btw first time in my life using fruit from our own apple tree!) last weekend and got 15 pounds. I find it so tedious to clean all of these little guys and get all the juice extracted, but when the job is done it’s so rewarding. I’m happy I now have 9 jars of jelly for the pantry, which has just run out of jam and jelly since I haven’t canned any this year. 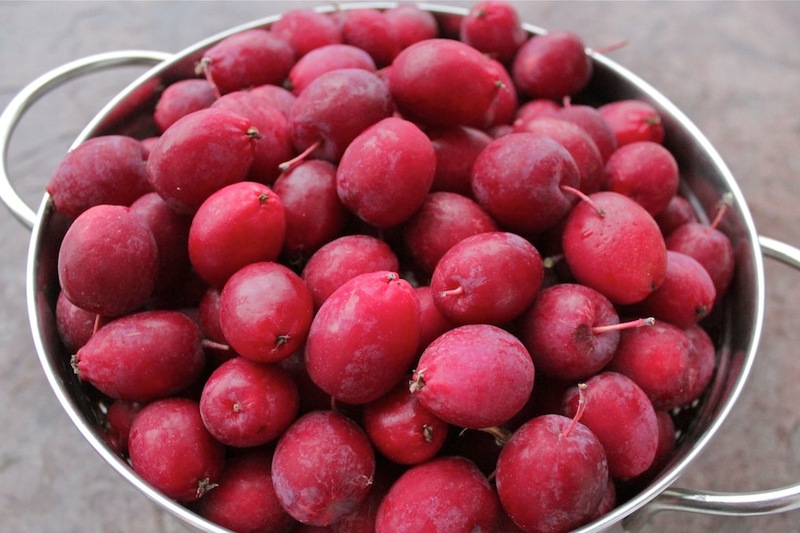 And the jelly has the most beautiful, brilliant pinkish-red color. 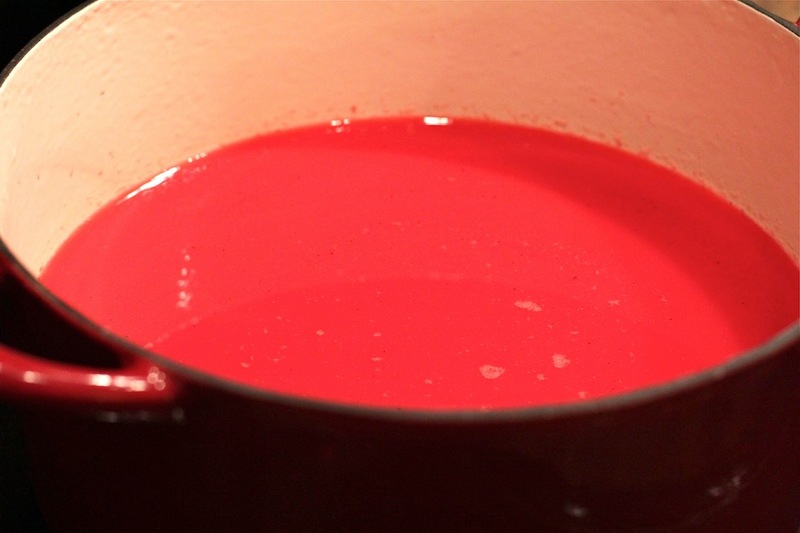 I followed the instructions from the Sure Jell packet for Crabapple Jelly, thus boiling the mixture for 1-2 minutes. Mine ended up a little thin and didn’t set up enough, so I would add on another 1-2 min. Follow canning instructions on the packet. I filled jars to 1/8″ and boiled in water bath for 7 minutes. My cousin helped me realize that I can just open one jar at a time and boil it for a couple minutes then return it to the jar and set in the fridge so it will set up more, rather than pour all of the jars into the pot and re-can all of them. Easy enough! Anyway, it’s very good and the perfect combination of tart and sweet. The color is so brilliant and pretty. Last weekend I made and canned Dill Pickles for the first time. I don’t know why I didn’t do it last summer, it’s pretty easy and I’d love to have enough canned pickles for the whole winter and not have to buy them. I picked up the pickling cucumbers from a local farm at the Farmer’s Market, made up the pickling spice mixtures, made up the brine, and although the recipe from my Williams-Sonoma Art of Preserving book said to slice them into 1/2″ slices, I wanted long pickles so I quartered them lengthwise. I ended up getting five jars, which I was pretty disappointed by since I had several jars ready for canning and 7 lbs of pickling cucumbers sliced, but ended up running out of brine, and out of white vinegar to make more brine. I think the recipe has a shortcoming in how much brine it calls for having boiling and ready, but it could be from the way I cut my pickles. 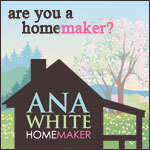 Combine and store in an airtight container for up to one year. Quarter cucumbers lengthwise and set aside. In each of the 8-9 sterilized and hot pint jars, fill with 1 dill head, 1 T pickling spice, 2 garlic cloves, and 5 peppercorns. Heat up vinegar and salt in a nonreactive saucepan/dutch oven and add the water. Bring the brine to a boil, and keep at a boil, until ladling into the jars. 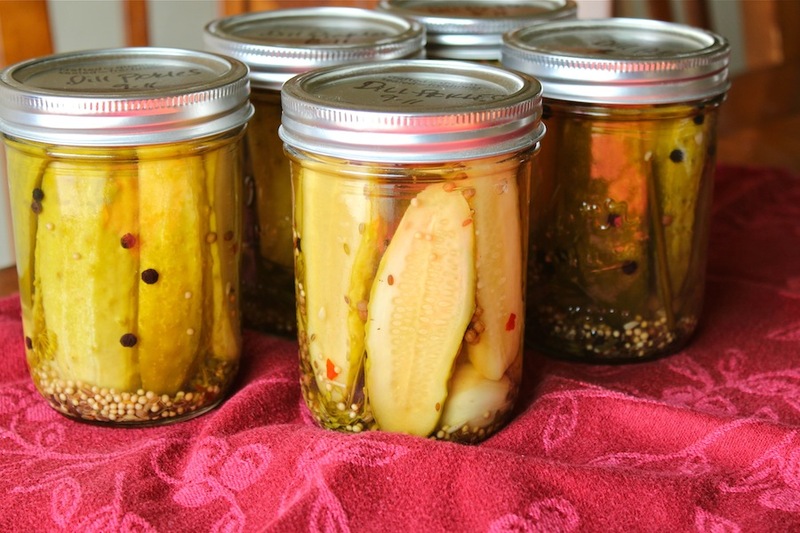 Fill the jars with the cucumber slices as tightly as possible, filling to within 3/4″ of the rims. Ladle the boiling hot brine into the jars, to 1/2″ of headspace. Remove air bubbles, wipe the rims, and seal tightly with the lids. Place the hot jars (work quickly so your jars are still hot) into the boiling water bath and process for 11-12 minutes (for 4-5k’ elevation). 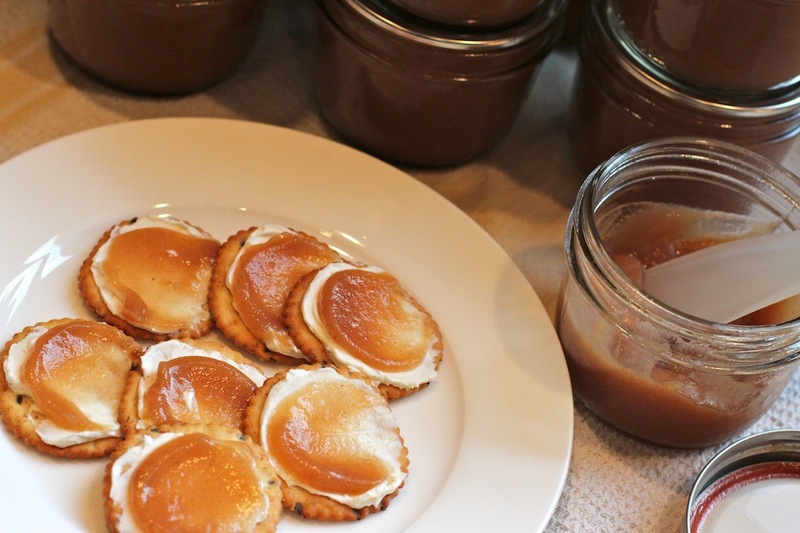 Set aside jars for two weeks to allow flavors to develop. Store in a cool, dark place and enjoy within a year. 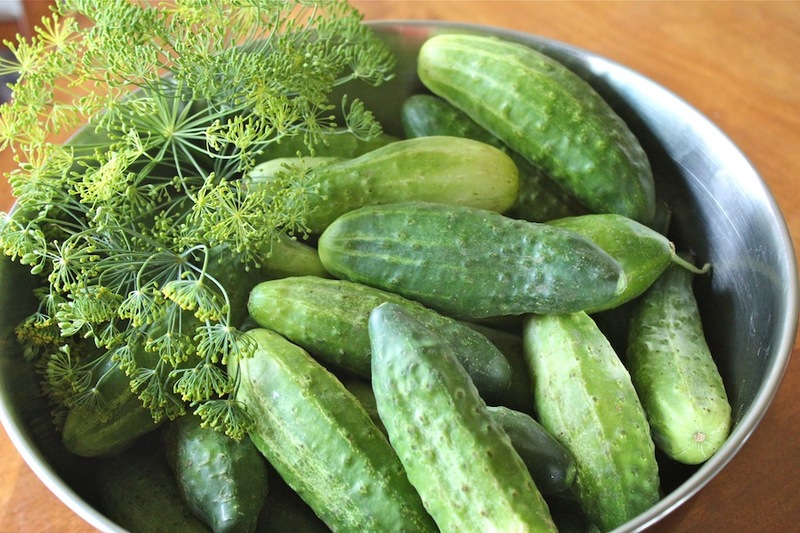 I picked up seven pounds of pickling cucumbers at the Farmers Market and am going to make and can Dill Pickles. I’m pretty excited, been wanting to do this for a while now and don’t know why I never did it last summer. 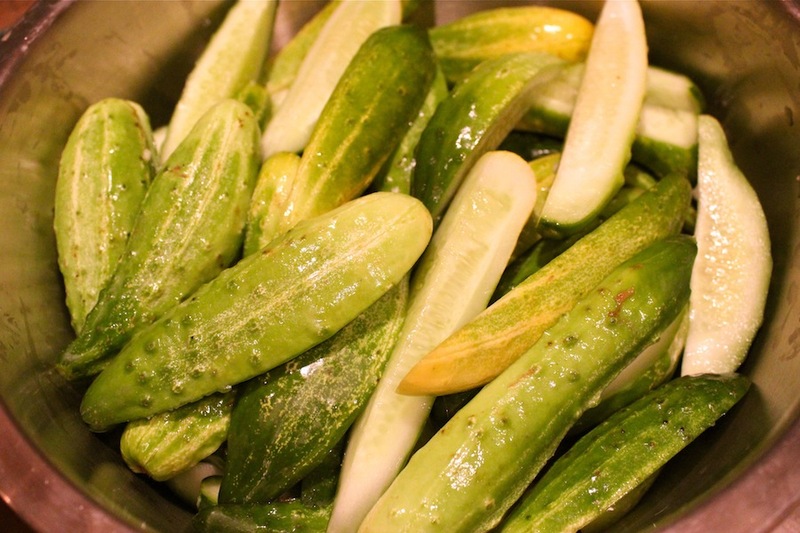 We planted some pickling cucs in our garden this year but I have yet to figure out how to grow them here. One of our unsuccessful garden plantings, we need some more warm weather here and a longer summer, and/or a greenhouse! As I was doing a ton of vacuum packing tonight, I just kept hearing Martha Stewart’s voice, “It’s a good thing”. Ha ha, well this is indeed. 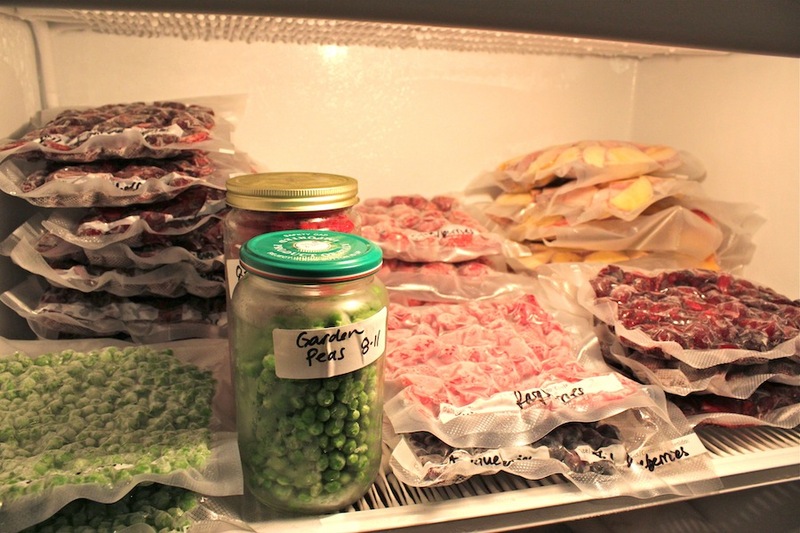 I’m pretty happy with myself that I’m getting the freezer stocked up pretty well, and just added green peas and strawberries from the garden, 14 lbs of Flathead Cherries, and some blueberries, raspberries, and 15 lbs of peaches from WA. 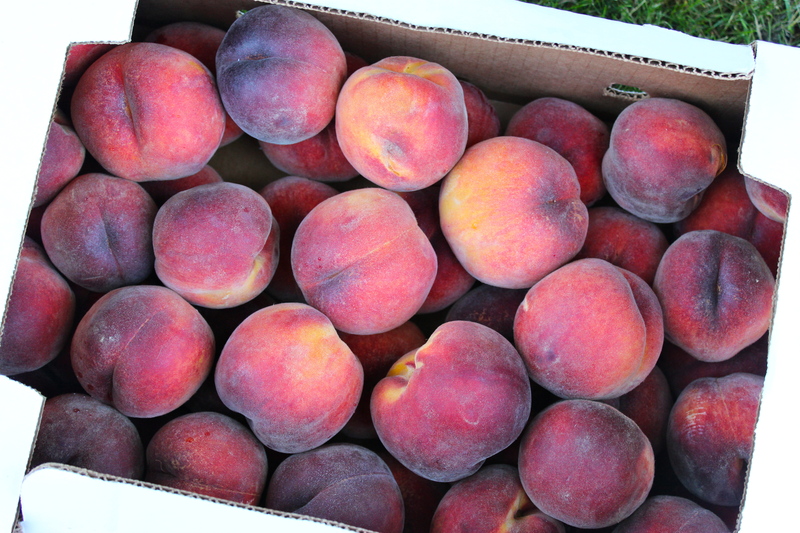 The 20 lb box of peaches has been sliced, frozen, and vac-packed, after of course much of them were enjoyed in a bowl with half and half, in a milkshake, or just by themselves for breakfast! Those milkshakes by the way were pure heaven. 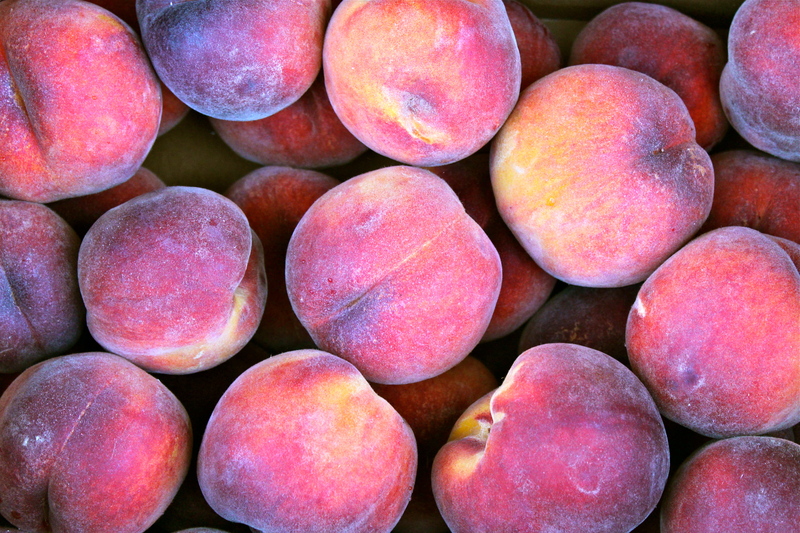 Alden’s organic vanilla ice cream, a little milk, and fresh peaches… MMM! 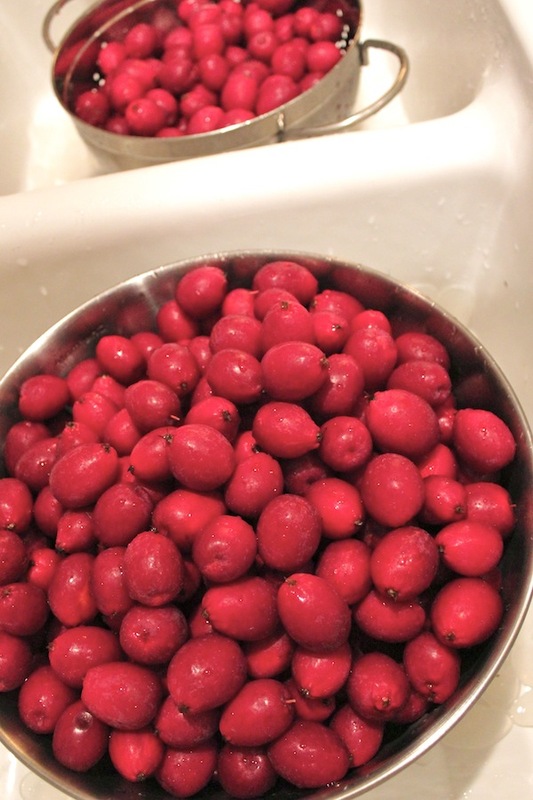 And the Flathead Cherries have finally all been pitted (oh how I do not enjoy all of that pitting), halved, vacuum packed, and frozen. I finally got the big freezer in the garage and the freezer in the house organized, and I just love that there’s still quite a bit of elk meat, and all this good stuff in there. There will be more good stuff added before winter hits. Last weekend we made a three day trip over to Idaho and Washington to visit all the family. I will hopefully post a few pics of the weekend, but for now, just some summer goodness. 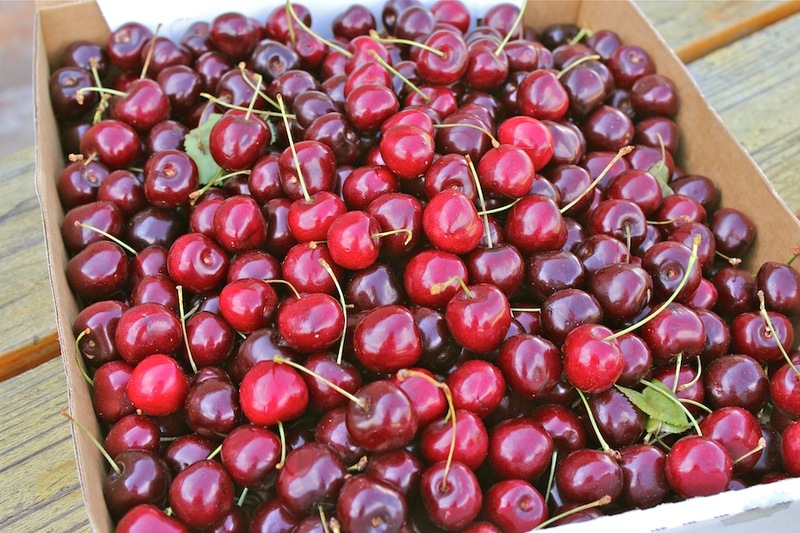 It was a good time, and we made a (very necessary) stop at the orchards at Green Bluff, outside of Spokane. I really love this area, and would love to go there at least a few times every summer. 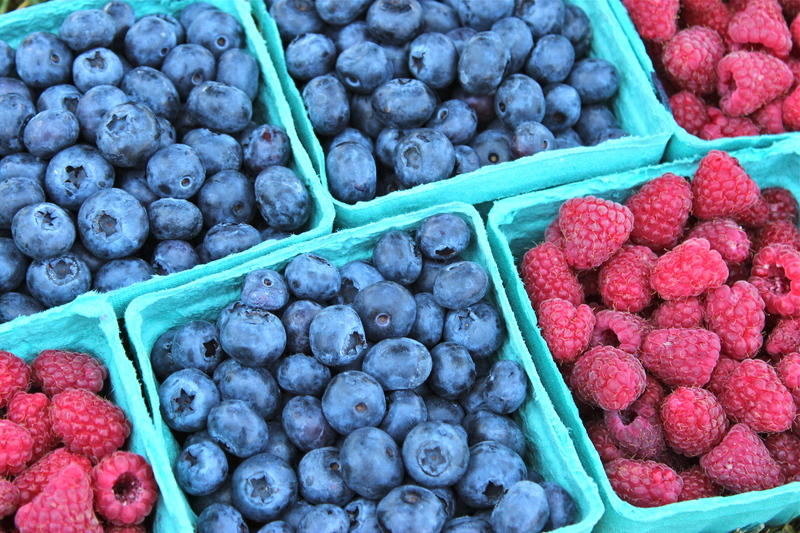 So fun to do the u-pick berries, peaches, and get your hands on all the fresh summer produce. 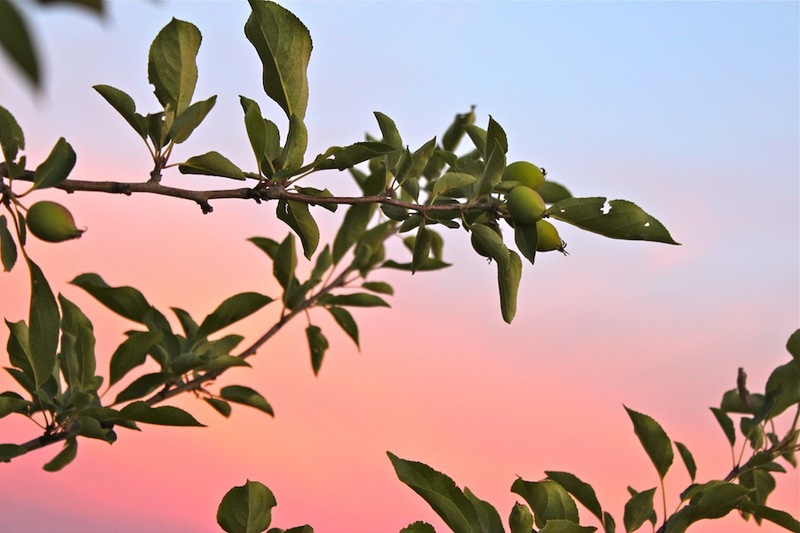 This time we didn’t have time to pick berries, it was very hectic (but fun) with visiting family, and having a 8 week old puppy with us on a roadtrip. 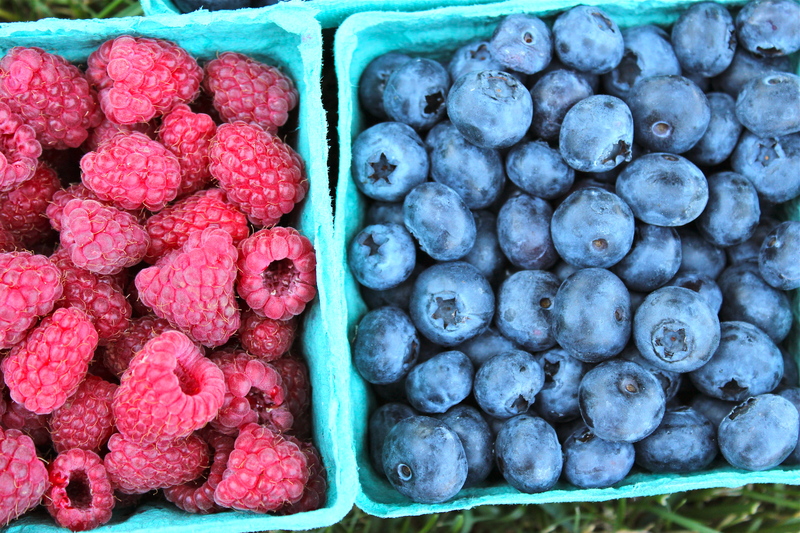 So we got a box of berries and a box of peaches.